The Obama Administration recently proposed a plan to open up areas in the Arctic and Atlantic Coast to offshore oil and gas drilling. Before any drilling can even be done, seismic surveys must be conducted, which explore the ocean floor to determine the size and location of oil and gas deposits. This is done through the use of "seismic streamers," an array of compressed air guns and hydrophones towed by a vessel. Ocean Conservation Research hosts clips so you can see and hear an exploding air gun. Map by National Geographic staff. Sources: BOEM, New England Aquarium, NOAA. On March 5, 2015, a letter from 75 marine scientists from leading organizations including the New England Aquarium was delivered to President Obama as a comment on this proposal, urging him and his administration to reject the Interior Department's decision to introduce seismic surveys for oil and gas deposits in the Atlantic. Why the concern? "To identify subsea deposits, operators use arrays of high-volume airguns, which fire approximately every 10-12 seconds, often for weeks or months at a time, with sound almost as powerful as that produced by underwater chemical explosives. Already nine survey applications covering the entirety of the region several times over have been submitted within the past six months, including multiple duplicative efforts in the same areas. In all, the activities contemplated by the Interior Department would result in more than 20 million seismic shots. 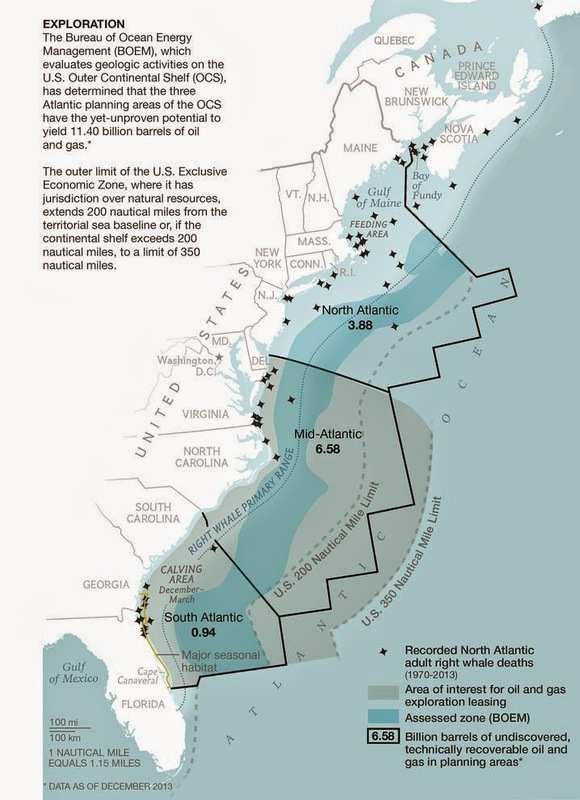 "Opening the U.S. east coast to seismic airgun exploration poses an unacceptable risk of serious harm to marine life at the species and population levels, the full extent of which will not be understood until long after the harm occurs. Mitigating such impacts requires a much better understanding of cumulative effects, which have not properly been assessed, as well as strict, highly precautionary limits on the amounts of annual and concurrent survey activities, which have not been prescribed. To proceed otherwise is simply not sustainable." The Interior Department has scheduled a series of "open houses" starting March 9, 2015 in varies cities in VA, GA, NC, SC, MD, NJ, and DE to receive comments from the public on the proposed drilling leases and seismic survey applications, and to hold additional general hearings. Find the date for a meeting near you! The comment period for the proposed Outer Continental Shelf Oil and Gas Leasing Program closes on March 30, 2015. Learn more about the proposal and if you feel so inclined, voice your concerns with a comment! Read the Aquarium's media release about the letter.